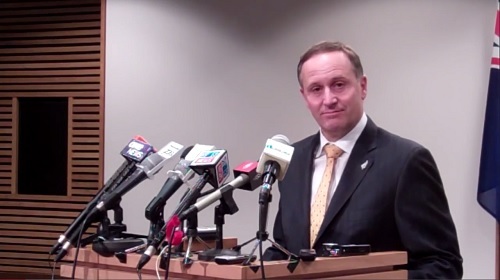 In the light of revelations today that John Key admitted in a press conference that he was “told me that [Warren Tucker] had released them because he has to tell me that under the ‘no surprises’ policy.” Earlier in the press conference he also made comment about having information whilst in the United States about Phil Goff and speaking about it while over there. This also obviously puts into question Mr. Key’s claim yesterday that he wasn’t briefed about Cameron Slaters OIA request because he was on holiday. Mr. Key obviously was active with conversations with ‘someone’ when he was on holiday to get the skinny on Mr. Goff, why would we then believe that the SIS didn’t inform him about this bombshell that was about to come out? If Mr. Key did, or didn’t lie, it actually makes no difference as he is 100% responsible for the actions of the SIS and his office, he is responsible and therefore needs to take responsibility. Ministers decide both the direction and the priorities for their departments. They should not be involved in their departments’ day-to-day operations. In general terms, Ministers are responsible for determining and promoting policy, defending policy decisions, and answering in the House on both policy and operational matters. I bring your attention to – Ministers are responsible for defending policy decision and answering operational matters. Secondly, if we take for a moment that Mr. Key had no knowledge of the meeting, and we choose not to hold him accountable for what should be his responsibility, then his department is failing in its duty. A department that he still needs to take responsibility for. In their relationship with Ministers, officials should be guided by a “no surprises” principle. They should inform Ministers promptly of matters of significance within their portfolio responsibilities, particularly where these matters may be controversial or may become the subject of public debate. The section states that officials should inform Ministers, not the Ministers office, not the Ministers aides, not ‘don’t worrying about not informing them if they are on holiday”. John Key was the Minister, this was the release of a document to a blogger which was going to be “controversial” and “become the subject of public debate”, therefore if John Key wasn’t informed, it’s a catastrophic failure in his own department…for which he is responsible. John Key needs to now fess up and tell the public of New Zealand the truth. If I was advising John Key I would say, ‘front foot this, tell them you lied, ask them to forgive you, and state that you still believe that you, and the National Party are the best option in this election.” If he doesn’t take control of this situation now, he could well be sitting in opposition as I predicted 18 months ago. So where we are at is either Mr. Key has lied, or his office and department are incompetent, it must be one of the two, and neither situation sits comfortably with the office of any Prime Minister.